We wanted to drive as little as possible in San Francisco and we wanted to walk the hills/use public transportation as little as possible. 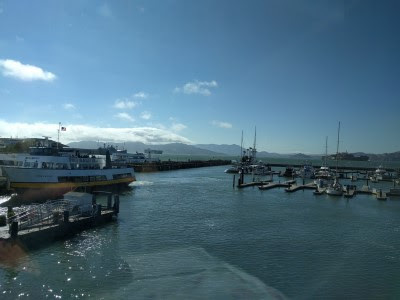 So we planned to dine in the Fisherman's Wharf and Embarcadero areas. Level walking we could handle. Our first night, we made an early dinner reservation at Fog Harbor Fish House at Pier 39. It might have been early (5:15 pm) but since we were still on east coast time, it was a late dinner, even for us. And we were really hungry. We were seated right away. We were lucky to be seated right next to a window with a lovely view. We both had iced teas. No alcoholic beverages - we were too tired already! Our starter: Dungeness Crab Cocktail served with cocktail sauce. 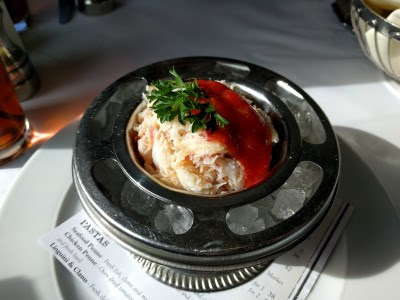 Of course while on the west coast we were going to order Dungeness crab. It has been a very long time since I've had crab served like this. It was delicious. The problem with sharing is sharing. I think we each could have finished an entire serving. I was a bit worried about upsetting my stomach because we had not eaten much that day so I didn't want a huge meal and I wanted to be sort of healthy. So I decided on Soup and Salad Combo (choosing mixed green salad) and I added Grilled Shrimp. 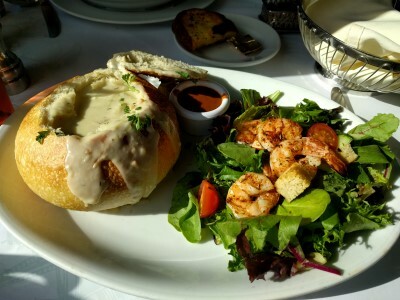 The soup was Clam Chowder in a Bread Bowl. It was just the right size for me and I knew SP would help me finish the soup & salad. There were 4 grilled shrimp. The soup was yummy and as usual, I enjoyed scooping out chunks of bread and then ripping the bread bowl apart. SP decided to sample all the fresh seafood! 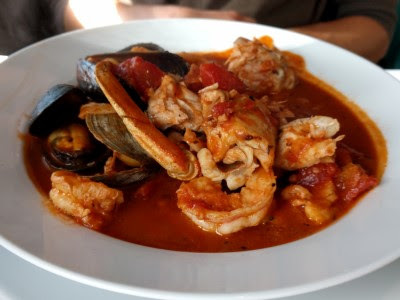 He chose Cioppino - crab, fresh fish, shrimp, clams, scallops and mussels, stewed in a seafood tomato broth. There was a lot of seafood in the cioppino. Definitely more generous than what we see in our hometown. He said it was delicious. He even wore the provided bib. We'd go back on our next trip to San Francisco. 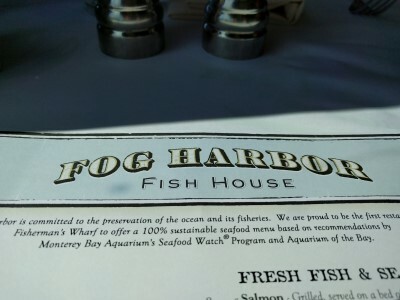 It was in a good location for us, wheelchair accessible, there was room to maneuver between tables, service was wonderful, everyone was friendly and helpful, a great view, and yummy food. Some might argue pricey, but it's in a tourist area, on the water, great views, and there's lots of seafood.